If you or your child experience recurrent ear infections, your doctor or pediatrician may recommend ear tube surgery to help alleviate symptoms. During this procedure, which is also called a myringotomy or tympanotomy, the surgeon inserts a small tube into a tiny hole that she puts in the eardrum. This hole allows excess fluid, such as water, pus or blood, to drain out of the eardrum. Ear tube surgery is most commonly performed on young children who develop frequent ear infections. Discuss any concerns you have regarding ear tube surgery complications with your doctor or pediatrician prior to receiving treatment. It is possible that the surgeon performing ear tube surgery could accidentally damage structures within the ear. 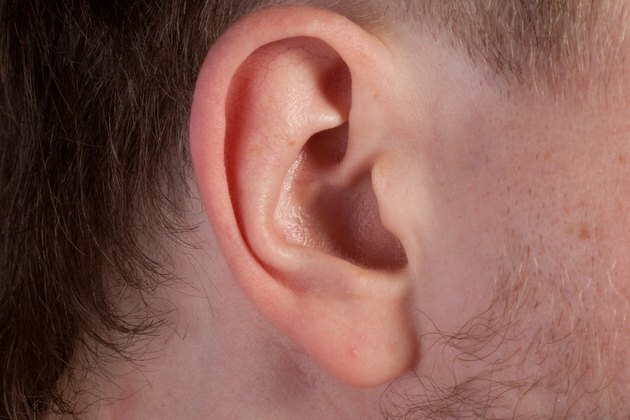 Ear damage can cause scar tissue to form within the eardrum or inner canals of the ear. This surgical procedure can also cause tearing or scarring of the eardrum, doctors at the Mayo Clinic warn. Such damage can cause hearing difficulties after surgery, which may be permanent. Additional side effects of ear damage can include pain, swelling or inflammation within the ear. Typically, ear tube surgery is performed to allow excess fluid to drain from the ear. After surgery, ear drainage should end within two to three days, according to New York University Langone Medical Center. In rare instances, complications after ear tube surgery can include persistent ear drainage that continues for more than four days following surgery. If this occurs, contact your doctor immediately for further guidance. In rare instances, the incision made within the eardrum during ear tube surgery may cause abnormal bleeding to develop. If this occurs, seek immediate medical care to resolve this complication. The incision site within the eardrum can become infected after ear tube surgery. Signs of infections can include increased ear pain or drainage, fever or excessive fatigue. Such symptoms require immediate medical attention. The ear tubes placed during this surgical procedure typically fall out on their own within 6 to 14 months. In rare instances, the tubes do not fall out as expected. If this occurs, a second surgery may need to be performed to remove the ear tubes.